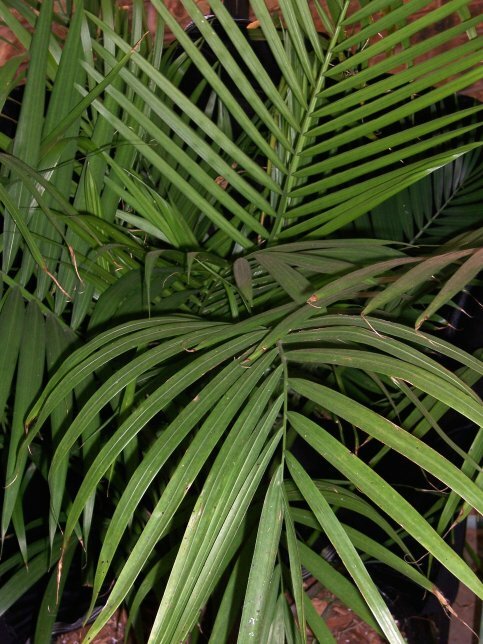 Ravenea rivularis is a slow growing palm native to Madagascar where it grows along rivers and streams. This is a fairly new addition, being 2 years old from seed. In nature, these palms will reach 40 feet (12 m) tall. Ours being a young palm has only reached 5 feet (1.5 m) tall in containers. The dark green fronds arch gracefully and the trunk is green with curious brown spots. Larger specimens will have a grey trunk. They make excellent container plants and in the greenhouse they have a light airy look about them. It is an easy palm to grow and will live in the landscape in USDA zone 9-11. Plant parts should be considered poisonous. Blooming: Our specimen has not bloomed. I believe they will bloom in about 5 years from seed. Culture: Ravenea rivularis need full sun to light shade with a moist rich moist soil mix. We grow ours under 25% shade all year long. In the greenhouse, we use a soil mix consisting of 2 parts peat moss to 1 part loam to 2 parts sand and we add 1 cup of 14-14 14 Osmocte slow release fertilizer to each 0.01 cubic yards of soil mix. The plants should be kept moist at all times and we fertilize on a monthly basis with a balanced fertilizer with extra iron added. During the winter months, the plants are kept moist, but we do not add extra fertilizer during this period. Specimen plants are repotted every other year and I'm quite sure this palm will outgrow the greenhouse at some point. Propagation: Ravenea rivularis is propagated from seed. Seed germinate 30-60 days from sowing at 72°F (22°C). Seeds where place in equal parts peat and sand and kept constantly moist. Ravenea rivularis was featured as Plant of the Week September 26-October 2, 2008.